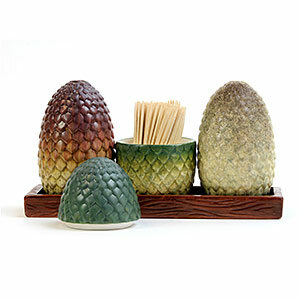 Game of Thrones – Dragon Egg Salt & Pepper Shakers an Officially-licensed Game of Thrones merchandise for the lovers of Game of Thrones to set the table with the proper spices – with these dragon egg salt & pepper shakers based on Daenerys’ three baby dragon eggs. This is a perfect wedding gift for a Targaryen and is made from Ceramic. It comes in a set of salt shaker, pepper shaker, and toothpick holder in a decorative ceramic tray.